Not difficult to top up the Vitamin D in the summer, is it? All that endless sunshine, those days by the pool and drinks on the terrace (well, that’s what my Facebook feed looks like anyway – thank you friends). But this summer, I’m stuck inside, working 12 hours days with a long, underground commute either side. So I may not be getting enough Vitamin D. It allows the body to absorb calcium to create strong bones and teeth, and it strengthens the immune system. All in all, a really good reason to book a half-term holiday in the sun. In the meantime, I’m upping my dietary sources of Vitamin D – including oily fish, eggs and dairy. (Check out our frittata recipe and watermelon and feta salad for some summery recipes which deliver Vit D). 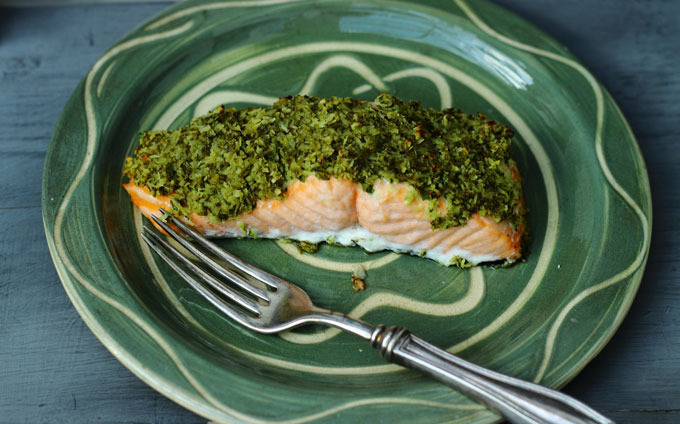 This salmon recipe is a big hit – with adults and children. It includes another of my favourite brain foods – coconut – so it’s a win win. Blend all the crust ingredients in the food processor till well combined (or chop the coriander and garlic finely and stir in the other ingredients). Put the salmon in a roasting tin and spread the coconut-coriander mix on top. Bake in the oven for 15mins. Serve with rice or noodles and green veg. Looks divine! Can’t wait to try. This looks delish – having lost my own Mum to Alzheimer’s anything to combat it is interesting. Your blog is inspiring keep it going! Brilliant blog. Thank you so much. Rare to find such excellent, tasty recipes AND most of them perfect for vegans. Thanks so much Julia. Do sign up for the weekly updates!